I totally forgot that breads that contains sugar needs a lower temperature to be baked and to avoid being brown. Luckily I have not ruined this one ... but it faded away the cocoa powder decoration so I had to use a light trick to make it more visible for this photo. Enjoy! Mix all ingredients for 4 minutes on a low speed and 15 minutes on a higher speed. Preshape 3 oblong loaves and let the dough relax for 15 minutes. Final fermentation in lightly floured bannetons 1h30 at 24ºC. Bake with steam in the first 15 minutes at 240ºC and continue for another 30 minutes reducing the temperature to 200ºC. This recipe was inspired from Le Larousse du pain - Eric Kayser, page 142. Thank you very much, Tiziana. Thank you, Susan. I have used a stencil (a cut plastic foil with a decoration) over which I have sprinkled cocoa powder. How are you doing the flour painting on the top of the bread? I mean How that ists so precise and its stick to the crust. 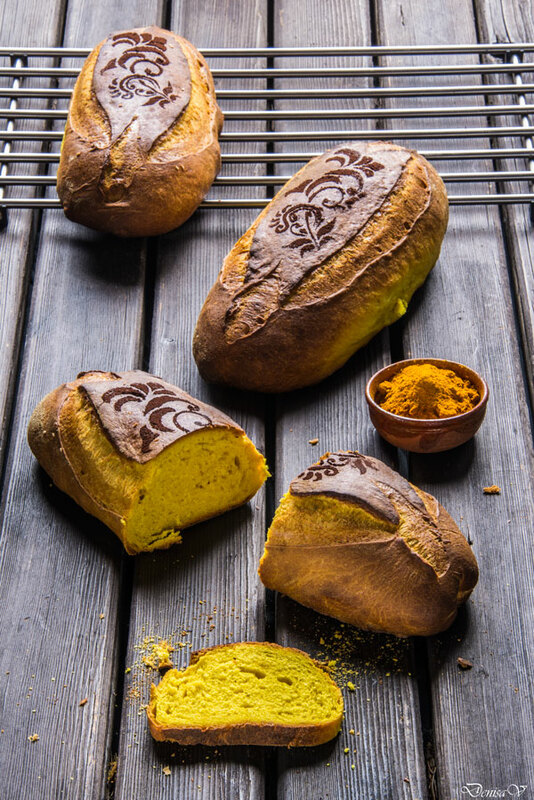 Radim Capek, before baking the bread, I first use a spray with water to moisture the surface of the loaf and then, I put a stencil over the bread and sprinkle flour. I remove the stencil carefully and this is how I get the pattern.